Photos from the Workshop by Doug Bates. The main idea of the workshop is to get as many R core members as possible plus some interested others together in one place and talk about ideas for the future of statistical computing. 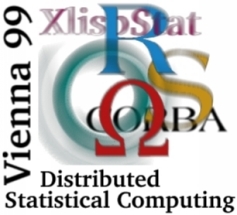 Contentwise, one focus should be on distributed (statistical) computing via CORBA, which is closely related to where the Omega project is headed for (e.g., defining the basic statistical data types for the IDL etc). There will be almost the complete Omega team participating. Other topics have yet to be discussed among the participants (please let us know). The meeting would be important for the success of the Center of Excellence Adaptive Information Systems and Modelling in Economics and Management Science. One long-term project is to create a simulation environment of intelligent economic agents (firms, customers, and finance markets), and using DC via CORBA with R as one of the computational back ends seems to be a very promising approach (much better than the original ideas with Linda, PVM, ...). The connection to this Center of Excellence will be only loosely, i.e., it should be seen as one possible application for the topics discussed at the workshop. for a special group rate of ATS 790,-- (EUR 57.41) per single room and ATS 1090,-- (EUR 79.21) per double room and night including breakfast. Please do not make any direct reservations but send email to the organizers about arrival/departure to ensure getting the group rate. The hotel is just a 5 minutes walk from the University of Technology, see map below. See a map with the locations of the hotel and University of Technology (TU) or a map of the complete center of Vienna. Vienna is one of the premier destinations for city tourism. The University of Technology is located at Karlsplatz in the center of the city, e.g., the state opera is just a 5 minutes walk away. So there is no need for planning a sightseeing trip ... you can do that during lunch break. And of course there will be one of the famous Viennese Heurigen dinners ("Heurige" are typical vine pubs of Vienna).